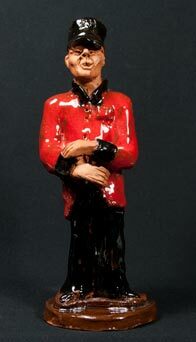 Chelsea Pensioner figure - 9" (228 mm) high. David Rawnsley was a man of many parts. He was born in Sevenoaks, Kent in 1909 and on leaving school trained as an architect and engineer. In his early twenties he became involved in the film industry, and worked on many films during the thirties and forties as an art director. There are some very well-known films in his CV including 49th Parallel, One of Our Aircraft is Missing, They Flew Alone and In Which We Serve. After the war he moved to Paris and opened a pottery there. It was in Paris that he first met Joyce Morgan, who was working in the city as a fabric designer. This was the beginning of a business relationship that was to last for many years. Back in London in 1952 David and his wife Mary started up the Chelsea Pottery in Radnor Walk, SW3. It was styled an 'open studio' - a place where any potter could come to work and learn. The pottery was run on a 'club' basis, as had been the Paris pottery. Members paid five guineas (£5.25) as an annual subscription and sixpence (2½p) an hour plus the same amount for a pound of clay. Lessons were held in the evenings for amateurs with Joyce Morgan as the main instructor. In 1959 the Rawnsleys left for the Bahamas in search of a place to start up a new pottery in the sun. They found a large 18th century town house in Nassau. Joyce Morgan joined them there, sailing from England with five huge packing cases, the contents of which included, among other things, an electric kiln. There was no suitable clay in the Bahamas, and plans were made to import it from Jamaica, but there were serious problems with transportation; the clay had to come in rickety old banana boats that were not really up to carrying the extra weight. When the first batch arrived it proved to be of inferior quality with a very high sand content, so arrangements were made to import clay from Ireland. This was good clay with very plastic qualities, but a little too white, so iron was added locally to redden it up a little. Joyce was not very happy in Nassau. She disliked the very closed community where gossip was the main interest, the climate, and particularly the termites that were eating the building. She stayed there for only five months before returning to England. After a couple of years David moved on to open yet another pottery, this time in Mexico. Mary and the children came back to London and took up residence in Radnor Walk. David re-married; his new wife was an American doctor and they lived in California with frequent trips to the Isle of Capri where his wife's mother lived. On a solo trip to Capri in the early seventies David died of a heart attack. Meanwhile, back in London, SW3, the pottery had been left in the hands of Brian Hubbard who went on to run Chelsea for nearly forty years with the help of Joyce Morgan, modeller Frank Spindler, Barbara Ross, Daphne Corke and a large number of decorators, trained in-house, who lasted for various lengths of time. The pottery is best known for its highly decorated earthenware, the colour of the pieces being achieved by the use of painting and coloured glazes - a technique that has been referred to as 'inlay and overlay'. Joyce Morgan made all her designs in a book, and would open it at an appropriate page for each piece she decorated so that she did not have to do all the thinking again. For smaller pieces she sometimes made templates from paper or card and would engrave around them. Chelsea Pottery became very popular with the rich and famous. Many leading actors would commission pieces to be given as presents to the other members of the cast at first-night parties. In the early sixties Brian met the Beatles in a television studio where they were both being interviewed. It was the day, he remembers, that they bought their famous high-collar jackets at Cecil Gee in Charing Cross Road. They stayed in contact and later Chelsea were to supply Christmas mugs for Paul McCartney for about twenty years. Trade was good, and orders were rolling in from American department stores - Lord and Taylor and Neiman Marcus amongst others. A division was set up to produce slipcast wares; Ceramic Design, Chelsea. Frank Spindler produced models from which Brian Hubbard made moulds. As well as the slipcast products, Chelsea also found a good market for hand-made models. Most were made by Frank Spindler, but other people, notably Joy Hindmarsh, took their turn to help supply the ever increasing demand. Brian Hubbard and Damon, David Rawnsley's fourth child are known to have made some of the models. Judges, barristers, surgeons and dentists were made in the largest numbers, but fishermen, golfers, mermaids and other subjects are to be found. The pottery had to move from its Radnor Walk premises in 1994 when the lease expired. Brian and Joyce desperately sought new affordable premises but had no luck. An offer was made by Moorcroft's to buy the company, but that would have meant a move to the north of England; something that neither Brian nor Joyce wanted. At the last minute a gentleman arrived out of the blue to save them. Richard Dennison bought the company and found new premises for them at nearby Ebury Mews. They occupied three stable units, installing the kilns downstairs and doing the throwing, modelling and decorating upstairs. There was haircord carpet on the floors and they laid sheets of hardboard to protect it. At this time they were as busy as they had ever been, but the market was against them. The dollar/sterling exchange rate killed all their American trade, and they found they were working harder and harder for smaller and smaller returns. The lease on the Ebury Mews premises was for only three years, and it was non-renewable. Rents and rates were rocketing, so when the time came in 1997 they called it a day and the pottery closed.